When you least expect it a brick wall will fall down, or at least a few bricks break off. Family Search has been adding a lot of new documents to their on line library. Just recently I found multiple documents that extended my Eyth line and confirmed several birth and marriage entries. Birth records from Germany help with family lines. I had tried a search for my Siffrinn line and did not find any new records. Yesterday, for fun I entered the Siffrinn surname, not expecting any results. 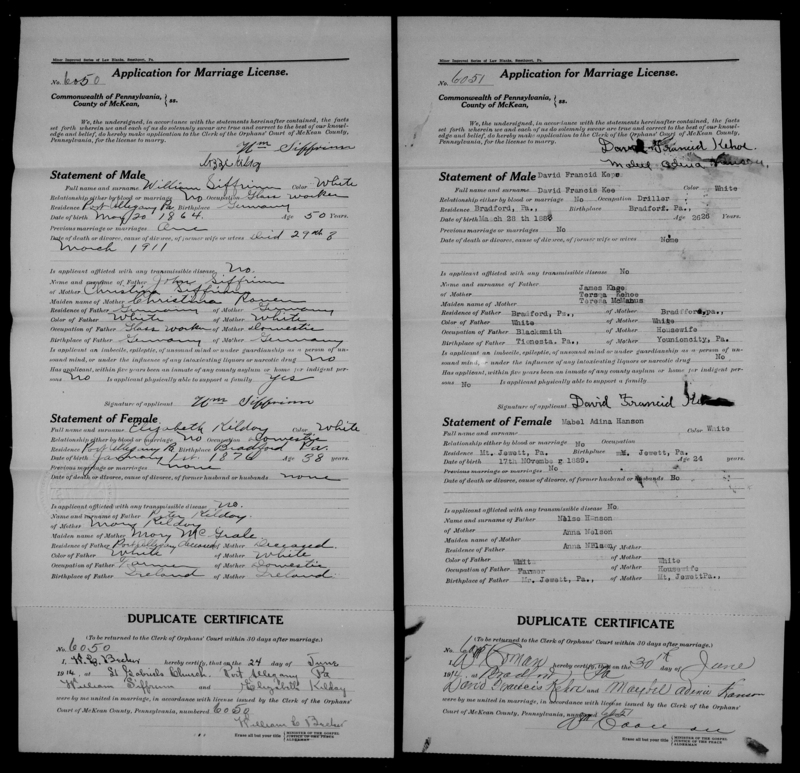 Up popped Pennsylvania marriage certificates for several Siffrinn surnames. I glanced through the selection and clicked on a William Siffrinn. The details of the entry included a full name, William Siffrinn, birth of Stolberg, Germany and birth date of May 20 1864. He was the son of John and Christina Ronen Siffrinn. It also documented his marriage on Jun. 24, 1914, to Lizzie Kilday, daughter of Peter and Mary McGrale Kilday, born in Pennsylvania, Jan. 1, 1875. The marriage was documented as taking place in Port Allegany, Pennsylvania. The last clue on the document was that he had been married previously and his wife had died March, 29, 1911. I saved the document to my desktop, curious at first that it was missing information to Louis and Caroline’s son, William, except for the information given as to parents. I opened the next result for William Siffrinn, I now had the clues that linked my SIffrinns to their German past. This was the same William Sifffrinn as the first document that I had opened for his first marriage to my great-great grandmother. I knew that my great-great grandmother had remarried after the death of her husband Louis Siffrinn. I was pretty sure that the man that she married next was the brother of her husband but I did not have proof. The marriage documentation documented that William Siffrinn was marrying his brother’s widow, Mrs. Caroline Siffrinn, a midwife, her maiden name was Everhardt. 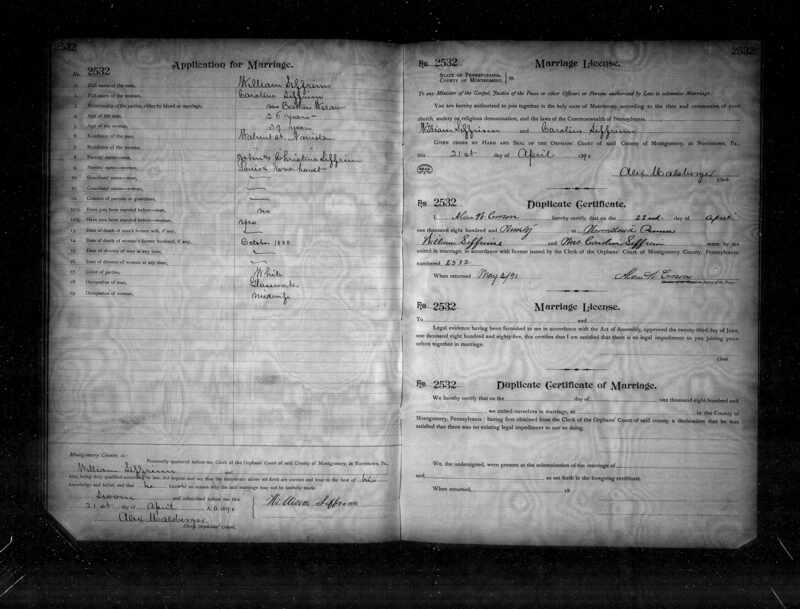 The marriage took place 2 years following the death of my great-great grandfather in Oct of 1888 and a year after the birth of John Siffrinn, Caroline and William’s son in Norristown, Montgomery, Pennsylvania, outside of Philadelphia, Pennsylvania. William had arrived in the United States in 1886, four years after his brother and family had moved to the Philadelphia area from Germany. The men were glassblowers in Philadelphia. Although I still have not found the passenger list for the Louis Siffrinn family’s arrival to the States, I am pretty sure that they immediately settled in the Norristown area, not arriving in Kane or Port Allegany Pennsylvania until close to 1900. In the 1900 Census Caroline has listed that she has had 12 children of which 7 are still alive. More searching would reveal a daughter that I did not have listed, Mary Siffrinn born in Germany in 1876, married to Joseph E Grant born in England April 1872. Searching on Mary in Census records I found her living with her sister, Emma born in Germany 1869, another new child for my file, and her brother-in-law, John Norman born in Germany, Mar. 1857. Caroline’s 1900 Census record lists, her married to William and children, Augusta, Peter, and John living with her in Kane, Pennsylvania. William was working as a glassblower; the children were all in school. Some of the family remained in the Norristown, Pennsylvania area, which now broadens my search area considerably for the remaining four children Caroline gave birth to as claimed in her 1900 Census record. This went blank as soon as I started reading it. That is so strange. Is it still blank?